Earlier today, Capcom announced Resident Evil 7 for Nintendo Switch, a special version of the game that runs in the cloud. This Cloud Version is only a 45MB download but requires a constant internet connection to play it. Nintendo Switch owners and Resident Evil fans rejoice, Resident Evil 7: Biohazard is coming to the hottest hybrid console in town. Japanese-town that is. Yes, Capcom has annouced through a trailer, that a “cloud version” of Resident Evil 7, will hit stores in Japan later this week on 24th May. Resident Evil 7: Cloud Version is only a 45MB download but requires a constant internet connection to play it. The game will cost 2,000 yen ($18.02, but probably $19.99 in our territory), but that won’t get you the full game. Instead, 2,000 yen gets you 180 days of playtime, and we assume you’ll have to buy another 180 days once that’s up. There will be a demo that allow users to try Resident Evil 7 for 15 minutes. Resident Evil 7 Cloud Version will arrive with the full suite of DLC, including “Banned Footage” Volumes 1 and 2, “End of Zoe,” and “Not a Hero,” all of which are former downloadable upgrades to the main game. Essentially, gamers can purchase six months of access to the complete experience, with no need to download it in full, conserving the Switch’s limited storage space. We don’t have any word of an English release yet, but we’ll keep you guys updated. 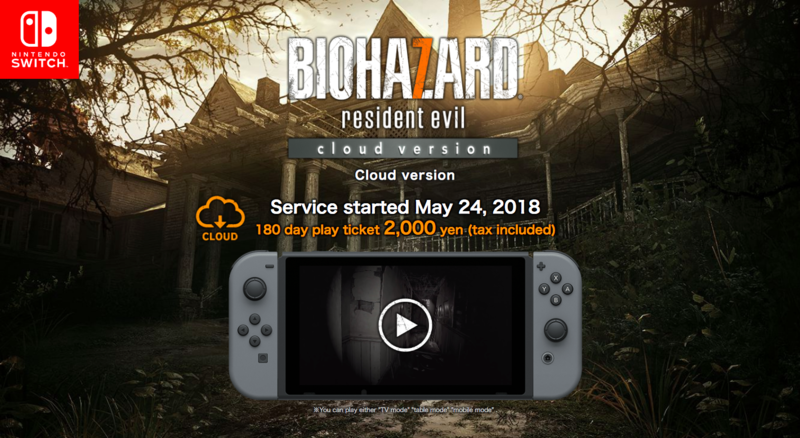 The Resident Evil VII Biohazard Cloud Version is definitely an interesting experiment that could pave the way for other games to become playable on Nintendo Switch through streaming. And by the way guys, this isn’t a novel idea for the Japanese market. Square Enix’s Dragon Quest X MMO has a cloud streaming version for 3DS and smartphones, and there are also cloud-powered mobile versions of games like Final Fantasy XIII. Sega’s Phantasy Star Online 2 for Switch works the same way. Now all we have to do, is wait and see how well it runs on the Switch. Capcom’s most recent main entry in its long-running survival horror zombie-slaying series was first released in January of 2017 for PC, PlayStation 4 and Xbox One. It returned to the series’ horror roots after a number of games in the action genre. Resident Evil 7: Biohazard tells the story of Ethan Winters, a systems engineer whose wife has been missing for several years. His search for her leads to a southern plantation home in Louisiana, where he eventually encounters a disturbed family of zombie-like psychopaths known as the Bakers, with even more disturbing horrors existing within the bowels of the house.